Animals are amazing creatures. They provide companionship, comfort and a relationship like no other. At EASE Animal Massage, we are passionate about animals and their well-being, and offer a gentle, effective approach to enhance their lives. Our services include regular animal massage for both canine and feline friends or targeted therapeutic sessions for specific healing. We can give back to them by attending to their needs with a healing massage. EASE Animal Massage is a mobile unit that will travel to your home or office. We are committed to the health and well-being of small animals and will partner with your preferred vet to customize a therapy program to fit the needs of your pet. Discover the many benefits of the power of touch. Enhances the quality of life, relieves stress, promotes bonding, supports health and wellness. Through the art of therapeutic massage, we can help the healing process immensely while reducing swelling, pain and even stress. "Betsy was terrific with my Bella who was limping around and having difficulty getting up after laying around. After 4 visits she is putting weight on it again and walking on all four paws again. Betsy's gentleness and patience was evident from the moment she walked in the door. I highly recommend EASE Animal Massage and Betsy if you love you pet!" "Just had Leo boy worked on for his hip dysplasia. It was a wonderful experience for him and she’s excellent. She literally put more spring in his step. I couldn’t express how much Leo enjoyed it, at times he fell asleep! She also worked on our rescue case Rio! What a great person! I highly recommend!" "...Elizabeth's calming presence had Kramer adjusting well in no time! He absolutely melted when she began the massage and almost fell asleep at one point!..." I see that animal massage is of value, it’s truly therapeutic for the dog and for the human watching the techniques being performed, and we have complete and total trust for Betsy’s work. It was not long after she started the session that I could see a transformation in his demeanor, I was amazed… Betsy, I can only describe as a dog massage angel, I would recommend her to anyone. 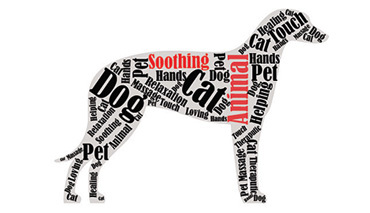 * Animal massage is not, nor is it intended to be a substitute, for traditional veterinary care. Any therapeutic treatment will be under the direct supervision of a licensed veterinarian. Copyright © 2019 Ease Animal Massage™ LLC All Rights Reserved. Web Design by Higher Images, Inc.